Club Penguin Cheats by Mimo777 Club Penguin Cheats by Mimo777: New Club Penguin March 2010 Clothing Catalog Sweet Cheats! 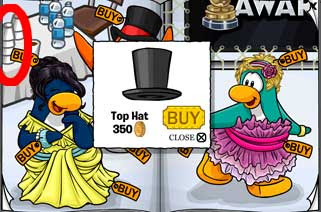 New Club Penguin March 2010 Clothing Catalog Sweet Cheats! 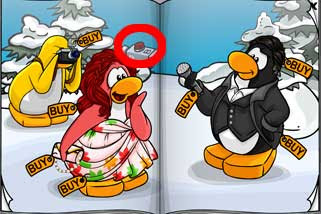 The hidden Club Penguin Cheats in the Penguin Style Clothing Catalog for Febrary 2010 are here! Step 5. Click to the 3rd page. Step 6. Now click on the water bottle. 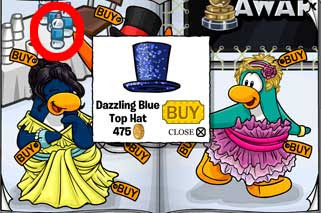 Now you've found the Dazzling Blue Top Hat! Stay on the 3rd page. Now click on the cups. Now you have found the Top Hat! Here's how to find the next Club Penguin cheat. Step 7. Click to the 4th page. Step 8. Now click on the red light. 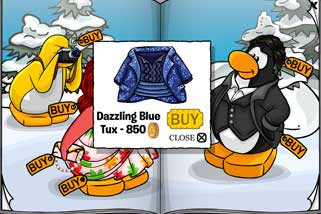 Now you've found the Dazzling Blue Tux! Step 9. Click to the 5th page. Step 10. Now click on the tree top, the mountain top and the other tree top. Now you've found the Purple Spring Dress and Brunette cheat! Now you've found the Pastel Suede Jacket cheat! Now you've found the Pom Pom Scarf cheat! To find the next Club Penguin cheat do this. Step 11. Click to the 6th page. Step 12. Now click on the Snowman's Nose. Now you found the Pink Snorkle! Step 13. Stay on the 6th page. Step 14. Now click on the Snowman's Hat. Step 11. Stay on the 6th page. Step 12. Now click on the mountain peak. Now you found the Pink Flippers! Here's how you find the next Club Penguin cheat. Step 13. Click on the 7th page. Step 14. Click the large bubble by the fish. Now you have the RED Viking Helmet. Now click on and off the bubble 4 times to get the Blue Viking Helmet cheat. Here is how to find the next cheat. Step 18. Click on the Tree top in the left corner. Now you found the Red Long Johns. Try the Buzz Market at Garden Party World! It's awesome. Buy and sell rare items! WOW! They are so sweet cheats thanks alout mimo. Mimo! where are the green items! I saw a penguin holding a Golden Penguin... Where did he get it? I can decode the message! But I'm not going to ruin it for everybody by saying it aloud! COOL! LOL, im sure we will find out! Nice job! Dear Kristel234, I think you mean the green items in the Furniture Catalog, not the Clothing Catalog. If you meant a different thing, tell me! Well, that is a Penguin Awards trophy, from last year show. maybe, you will be able to get it again this year! Good timing! Actually the "golden penguin" is what you get at the Penguin play awards. Maybe it's a yellow/orange puffle. The orange one has just been released. I decoded it! I would follow you but i dont tweet. i decoded the secret message!!! but what does the second one mean i read it but dont understand!!! I decoded it but i dont wanna tell! SHHHHHHHHHHHH!!!!!!!!! They in fact got that goldedn penguin from last years penguin play awards! you had to be a member and go backstage to get it as a free item. It is a less likely chance that it will be there again. we always hope for new items! But one thing WILL be the same, u can meet really famous penguins! I met everybody back there!!!!! I met everyone back there! (Except of course RH) I didnt meet gary tho. but i could have but i never found him. Be on the lookout for the 2nd annual penguin play awards!!!!!!!!! He got it last year at the penguin play awards. It might come back. 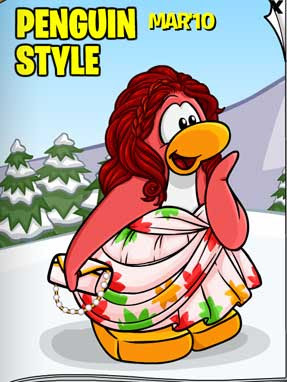 Those are VERY scandalous outfits for Club Penguin. i dont know how you do it! He/She Got it from last year at the penguin plsy wards back stage on for mambers! If you are a member it might come this year agin! They got it from the penguin play awards last year. Woah Woah Woah! don't give it away! Pozro says... I can decode the message too!Mimo,I think when the cave is open,the new mission is here too.But im not sure if im right. the golden penguin is a Penguin Play Award, or PPA. He probably won it. will clothes come back in 2011?